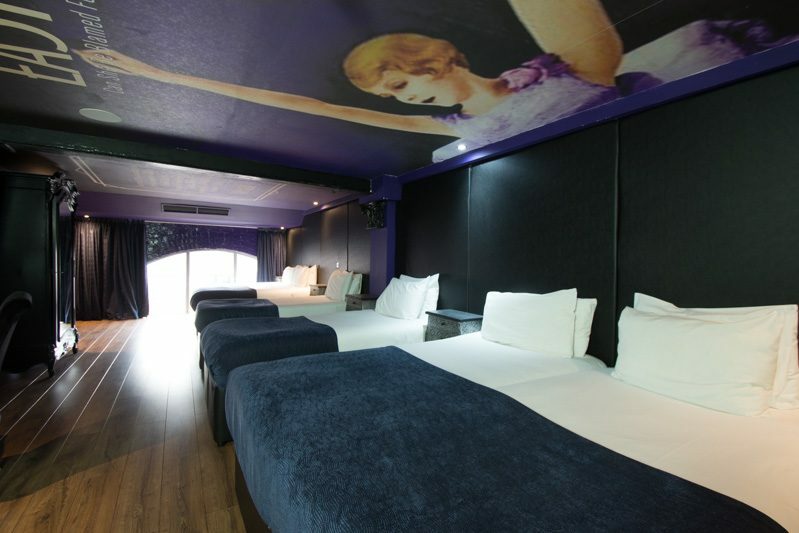 For stylish accommodation in Liverpool city centre, look no further than Arthouse Hotel. Echoing the style and glamour of early Hitchcock movies, the Easy Virtue room is truly extraordinary. Sleeping up to six guests, this spacious room is a a fantastic spot for groups of family and friends. Alternatively, this is a perfect room for couples With interior guaranteed to transport you back to the dazzling 1920s, the room’s fabulous interior is complemented by luxury facilities to enjoy at your leisure. Whether you’ll be heading out for sight-seeing or a night out on the town, you can guarantee a relaxed stay upon your return. Simply sink into one of our comfortable, deluxe beds or lay back and enjoy the tranquil whirlpool bath. Arthouse Hotel is nestled away behind the city’s leading bars and restaurants, so you’ll find everything you need right on your doorstep. A hidden gem amongst Hitchcock’s impressive filmography, Easy Virtue is a 1928 British silent romance film, directed by none other than the legendary Alfred Hitchcock himself. Starring Isabel Jeans, Franklinn Dyall and Ian Hunter, Hitchcock’s film adaptation was inspired by the 1924 play of the same title. Isabel Jeans plays Larita Filton, a woman in search of a fresh start following a turbulent divorce case. Heading to the sunny French Riviera and leaving her scandalous divorce in the past, Larita meets John Whittaker, a wealthy young man whose family don’t approve of her. Courted by John into a whirlwind engagement, the couple return to England, where the Whittaker family begin to question Larita’s identity. John’s mother questions where she recognises Larita from, causing Larita to worry about her past creeping up behind her. John’s family express that they see Larita as a woman of “easy virtue”, after finding a picture of Larita in the papers. Fearing for her family’s reputation, Mrs Whittaker continues to make Larita’s life uncomfortable, and Larita plots to leave John so he can obtain a divorce. A classic Hitchcock ending, Easy Virtue ends with plenty of drama. Larita exits the court, exclaiming to photographers, “Shoot! There’s nothing left to kill”. Though Hitchcock’s most famous films surpassed the silent era, the first nine films directed by Hitchcock were made throughout the silent era. A younger Hitchcock had been inspired during his time in Germany. He had seen the work of F.W. Murnau and Fritz Lang first hand, and their skillful talents stuck with him. From stylised lighting to perfected design, Hitchcock developed an eye for dark, mysterious filming techniques that translated into his own work. Alongside Easy Virtue, Hitchcock’s silent films include The Pleasure Garden (1926), The Farmer’s Wife (1927) and Champagne (1928). Though Hitchcock’s silent films are arguably lesser known than his later projects, audiences from far and wide enjoy seeing how Hitchcock’s visions and skillful techniques progressed. Not to mention, the alluring plots and old Hollywood talents are enough to keep viewers hooked. “The silent pictures were the purest form of cinema”. The talented director began to make his mark on the film industry in 1920. With hindsight, it’s hard to imagine Hitchcock starting from the bottom, but that’s exactly what he did. Putting his artistic skills into practise, Hitchcock’s career started with drawing film sets. It wasn’t until 1923 that Hitchcock was hired to direct Number 13 (1922), fuelling Hitchcock’s ambitions and building his experience. Following a sequence of success, Hitchcock and his family set off for the brights lights of Hollywood, where Hitchcock’s career flourished into a hurricane of success. Audiences were enthralled by his sharp camera techniques and stylish aesthetics. Not to mention, Hitchcock’s ability to keep audiences on the very edge of their seat proved impeccable. There’s no doubt that the work of Hitchcock has stood the test of time. Though film has shifted from silent and black and white to vividly colourful and even 3D, Hitchcock’s timeless classics are unparalleled, leaving a lasting legacy in the world of cinema.